The act of journaling or keeping a diary has been used for centuries by various cultures, but did you know that writing daily can reduce stress? It’s true. Journaling for only 15-20 minutes each day can reduce stress as well as symptoms of other physical ailments like asthma or rheumatoid arthritis. 1) Write when you can, where you can. Carry a small journal and pen with you in your purse or backpack that you can access whenever you need to write your thoughts or feelings. If needed, break up the 15-20 minutes of writing into smaller increments throughout the day. Take advantage of wait times to jot down a few thoughts(and prevent yourself from getting stressed about the wait!). 2) Keep your journal private. Although you may wish to share your journal with your therapist if you’re currently visiting one regularly, keep your journal private from everyone else. This will allow you to be unfiltered and free from worry about what someone else will think of your writing. 3) Write about stressful events as soon as possible after they happen. Try to write about the event, person, or situation as soon as it happens. Be sure to include in your entry not only what happened, but how the situation made you feel. Journaling is one of the cheapest and most effective therapies you can engage in, so take advantage of it today! 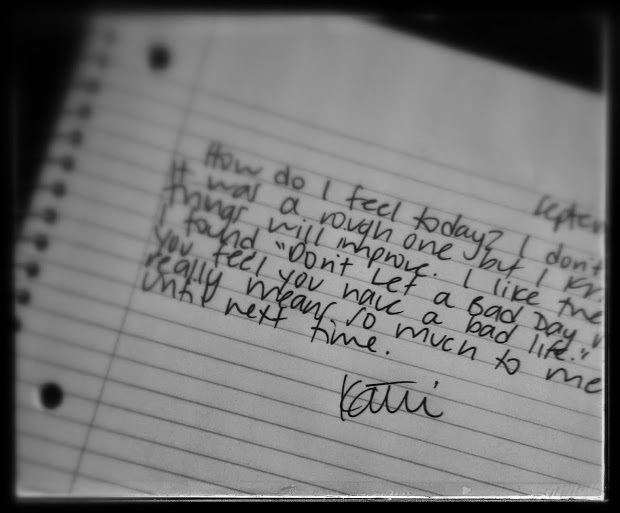 This entry was posted in "Knock Out Your Stress" and tagged Anxiety, Charlotte North Carolina, coping skills, journal, Mental health, stress, Stress management, Writing on September 17, 2013 by katieovercash.